In this instalment we’ll build on our basic understanding of CSS from previous instalment. We’ll start with some new CSS selectors, in the process, introduce two new HTML tag attributes, then we’ll move on to the CSS box model. Each HTML tag is represented in the page as a box, and all those boxes can be manipulated with CSS. Our first naive understanding of selectors was that they are simply tag names, so, we know we can specify style definitions for emphasised text with the selector em. That’s fine assuming we always want all our emphasised text to be rendered in the same way, but what if we sometimes need to apply different styles to emphasised text? 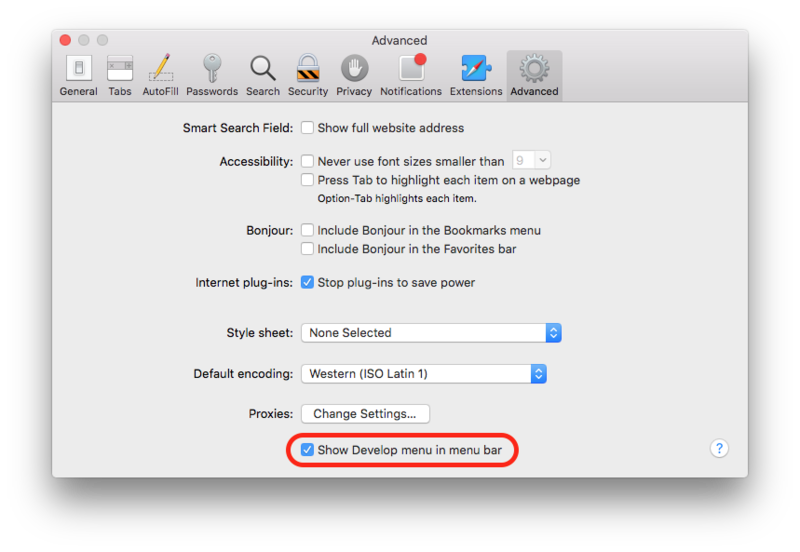 Solving this problem is what advanced CSS selectors are all about. There are many different scenarios in which you may need different styles on the same tag within the same page, and hence, there are many different CSS selectors. We’ll look at three new selectors in this instalment. You now include a quotation that contains emphasised text – that emphasis will vanish, because within a block quote, all text is now italic! You need to specify some additional style for emphasised text, but only within block quotes. Note that the concept is containment, not parentage. The above selector will apply to emphasised text directly within a block quote, as well as to emphasised text within a paragraph within a block quote. The depth of nesting does not matter. Note that the containment selector is not limited to one level of containment – you could style only paragraphs within list elements within ordered lists with the selector ol li p.
Every HTML tag can specify a class attribute. This attribute should contain one or more class names. When specifying multiple class names, the value of the attribute should be a space-delimited list. Adding classes to a tag will have no visible effect on the document without CSS. In effect, the attribute provides a hook to hang style information onto. To specify a class name in a CSS selector, the syntax is the name of the class pre-fixed with a dot. Note that there is no limit to how many classes you specify in a selector – if you only wanted to apply a style to paragraphs that specify both the classes vip and for-ref, you would use the selector p.vip.for-ref. Finally, note that you can apply the same class name to as many tags within a document as you like. Every HTML tag can specify an id attribute. Effectively, an ID is a name you give a tag that uniquely identifies it in the document. IDs have a number of uses, and we’ll learn about more of them as we go through this series, but for now, we’ll use IDs to target individual tags within a CSS selector. That is to say, not all instances of a given tag, but a single, specific tag. After the first character there can be zero or more letters, digits, underscores, hyphens, colons or dots. While it is legal to use dots in IDs, it causes complications when using the ID in a CSS selector, so it is advisable not to use them. 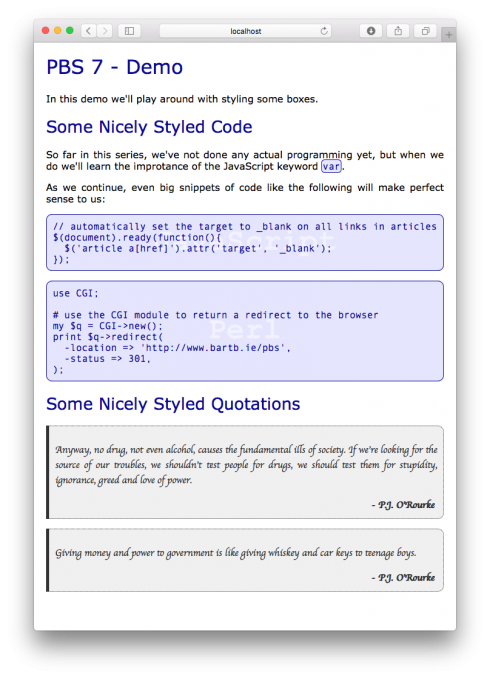 Unlike with classes, IDs should be unique within an HTML document. Selectors will get even more complex in future instalments, but for now it is important to emphasise that the three selectors were have learned about today can be combined in any arbitrary way. To apply a style only to emphasised text with a class vip within a paragraph with ID intro_text you would use the selector p#intro_text em.vip. Now that we have learned about tag containment, classes and IDs within CSS selectors, we need to re-visit the concept of specificity. 1 if the style definition was defined in a style attribute belonging to the tag being styled, 0 otherwise. To compare two specificities, start with the s, if they are different, the one with the highest s wins, otherwise, move on to i, again, if they are different, the one with the highest i wins, otherwise move on to c, and so on. If we add in what we learned about specificity last time, we can now say that the specificity of style definitions that are inherited from the portent, or specified with the * selector is 0,0,0,0. Finally – if the four-component specificity for two competing definitions is exactly the same, the rule defined the furthest down the document wins. 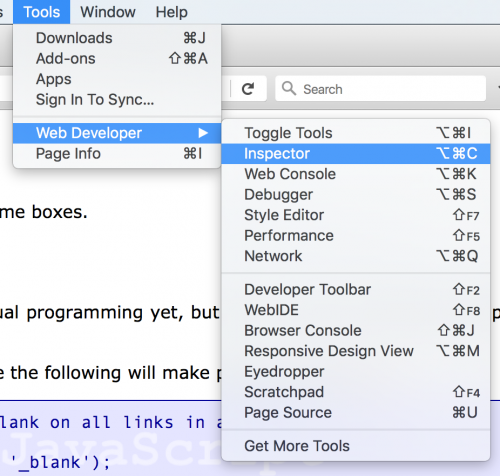 Within the browser, every HTML tag that makes up part of the page is defined by a rectangle, and that rectangle is referred to as the tag’s box. To build the box for an element, start with the content region itself. Around that you can wrap a region zero or more pixels wide in the same colour as the box’s background (transparent by default) called the padding, around that you can wrap a coloured region zero or more pixels wide called the border, and finally, around that you can add a transparent region zero or more pixels wide called the margin. Padding, border, and margin default to be symmetric, but each can have a different thickness on the top, bottom, left, and right. The boxes for block-level tags stretch to the full width of the the content area of the tag they are contained within, and stack one against the other, with the boxes touching each other. The body tag’s box extends to the edges of the content area of the browser window or tab they are appearing in. We can use CSS to style the box for any HTML tag. Written as an integer number with px appended, e.g. 4px. A dimension can be expressed as a percentage relative to some appropriate dimension – exactly what the percentage will be relative to depends entirely on the context in which it is used. Percentages are written as a number followed by the % symbol. For reasons now lost to history (though there are some plausible theories), in typography, the term em refers to the size of a font. In CSS, dimensions can be specified as being a given multiplier of the font size. This is done by specifying a number with the letters em appended to it. To specify that a dimension should be half the size of the element’s font you would write it as 0.5em. The margin is controlled by four CSS properties, margin-top, margin-right, margin-bottom, and margin-left. Each of these properties expects as valid positive dimension value – negative margins make no sense! Because it’s often desirable to set all four margins at once, CSS provides the margin shorthand property. It expects either one, two, or four dimensions separated by spaces. When one dimension is specified, that dimension is applied to all four margin properties. When two dimensions are specified the first is applied to the top and bottom margins, and the second to the left and right. Finally, when four properties are provided, they are interpreted as the top, right, bottom, and left values – in that order. An extra complication, although it does make sense, is that vertical margins which touch each other without anything in-between will collapse to the largest of the two margins. This sounds counter-intuitive, but it makes sense when you see it in action. For example, you may say that headers should have 20 pixels of margin top and bottom, and paragraphs should have 10 pixels of margin top and bottom. When a paragraph comes directly after a heading, you don’t want there to be a 30 pixel gap because that will look very odd indeed. What happens is that the margin will collapse to 20 pixels, because 20 is greater than 10. Horizontal margins do no collapse. Padding is specified in similarly to margins, but using the four properties padding-top, padding-right, padding-bottom, and padding-left, and the shorthand property padding. Margins and padding are represented by four dimensions, one for each side. Borders are a little more complicated, because each of the four sides of the border has a width (thickness if you will), colour, and style. 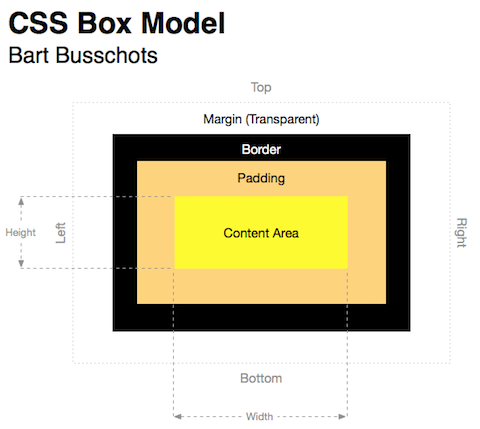 This means that the basic properties of a single box’s border is controlled by no fewer than twelve CSS properties: border-top-width, border-top-color, border-top-style, border-right-width, border-right-color, border-right-style, border-bottom-width, border-bottom-color, border-bottom-style, border-left-width, border-left-color, and border-left-style. The -width properties expect a dimension, like margin and padding, the -color properties expect a valid colour, like with the color property we saw in the previous instalment, and the -style properties expect one of the following values: dotted, dashed, solid, double, groove, ridge, inset, or outset. The default border style is solid. There are a number of shorthand properties to make setting borders easier, all five of them expect to be given one or more of a width, style, or colour, separated by spaces. To set all three properties on one of the four borders there are border-top, border-right, border-bottom, and border-left, and to set the three properties on all four borders at once there is the shorthand property border. CSS 3 finally introduced an officially supported way of rounding borders. 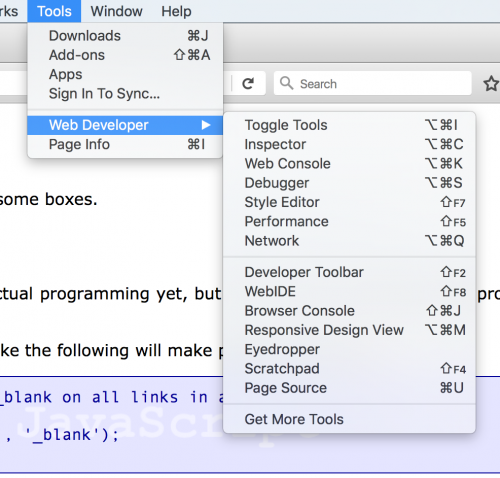 Individual browsers had support through non-standard style properties before CSS3, but they were different in every browser. In CSS 3 we can use the border-radius property to set the radius of the rounding of the border by specifying a dimension. The border-radius property is actually a shorthand property setting the same value on all four of the following properties: border-top-left-radius, border-top-right-radius, border-bottom-right-radius & border-bottom-left-radius. By default, tags have transparent backgrounds, but this can be altered by CSS. Backgrounds appear behind the content region and the padding, that is to say, everything out as far as the border, but not behind the margin, that region of a box is always transparent. The easiest element of the background to control is the colour. The property that control the background colour is background-color, and valid values are transparent, and any valid CSS colour. Images can also be used as backgrounds using the background-image property. The value for this property can be none, or the URL to an image. By default, a background image is tiled across the entire box (inside its border) from top to bottom and left to right. The tiling can be controlled with the background-repeat and background-position properties. The first of these, background-repeat, can have the values repeat, repeat-x, repeat-y, and no-repeat. The default value is repeat, that is to say, repeated both across and down. repeat-x means the background image should only be repeated across, and repeat-y means the image should only be repeated up and down. As you might expect, no-repeat means there should only be one copy of the image used. When only repeating in one direction, or not at all, the positioning of the background image becomes important. The background-position property is quite complex, but in general, you want one of the nice simple English values like center, top left, or right. You can get the full details here. This week’s example consists of four files – an HTML file, a CSS file, and two images used as backgrounds. You can download all four in a single ZIP file here. As usual, copy the four files into a folder called pbs7 in your web server’s document root, then browse to http://localhost/pbs7. 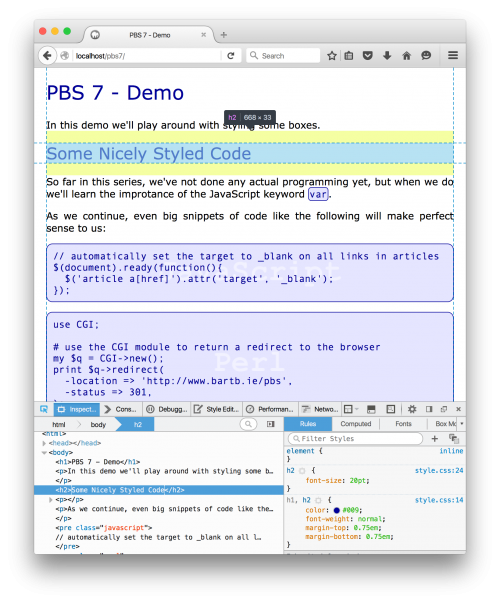 Because FireFox is cross-platform, that’s the one we’ll demo in this series, but like I say, all modern browsers have the ability to do the same kinds of things, just in slightly different ways. This will add new interface to the bottom of the browser window with two panes – one showing the HTML tags in the document, and one showing info about the currently selected tag. To see a tag’s box, just hover over it in the right pane, to see its properties, click on it. In the left pane, where the properties are shown, there are tabs to control what properties you see. The two that are of interest to use at the moment are Rules, which show all the CSS definitions in our stylesheets that apply to the selected tag, and Computed, which shows the rules that have been applied to the tag when all the cascading of styles and calculations of specificity have been done. This interface makes it much easier to debug your CSS, and will become even more valuable in the next instalment when we look at using CSS to position elements within a page. I love the PBS series. Even better than TTT. I’ve got some web experience, and some programming experience as well (mostly cold fusion, but I want to learn pgp) – I love the way you explain the basics, I am learning a lot of stuff that I had forgotten.